Blocking Keystone Won't Stop Oil Sands' Flow Into The U.S. Oil from the Canadian north is already making its way into the U.S. market through existing pipelines and tanker shipments. Energy experts say even if President Obama blocks the proposed Keystone XL pipeline, it may already be too late to stop Americans from relying on this dirty source of fuel. President Obama is feeling election-year pressure over the pending decision on the Keystone XL pipeline. Republicans say the Canadian project would provide the U.S. with oil and new jobs, but environmentalists want Obama to block it. They say Alberta's oil sands generate more greenhouse gases than other kinds of oil, and Americans must not become dependent on such a dirty source of energy. But it may already be too late to change that. Tucked in among the ranch houses in Burnaby, British Columbia, a quiet suburb east of Vancouver, is the terminal for the Trans Mountain Pipeline, which brings in oil from Alberta. For decades, that oil was mainly consumed in the Vancouver region. But that is changing. Ben West, an anti-oil tanker activist with a group called the Wilderness Committee, says when the pipeline company Kinder Morgan bought this facility in 2005, it shifted its focus to exports — primarily to the American West Coast. "We've seen this huge increase of tanker traffic," he says. "We went from 22 tankers in 2005, up to 79 [in 2010]. 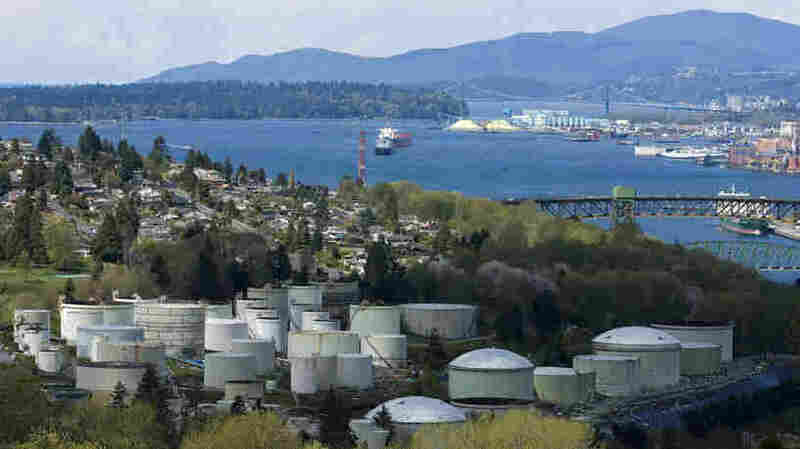 You know these 700,000-barrel tankers that are now coming through the Burrard Inlet, which passes through one of the most populated areas of British Columbia." The pipeline also has a branch that crosses the border, feeding crude oil to refineries in Washington state. Kinder Morgan is now exploring the possibility of doubling the pipeline's capacity. West calls it the "quiet repurposing" of the Trans Mountain Pipeline. And because of it, oil sands gasoline is now fueling cars from Seattle to San Francisco. Philip Verleger, an economist who specializes in oil markets, says even if environmentalists convince Obama to block the Keystone XL pipeline, it won't stop the growth of production in the Canadian oil sands. "With prices around a hundred dollars a barrel globally, that oil is going to make it to the market somehow," Verleger says. "The development may be slowed for a year or two. But one can move the oil west on the existing Kinder Morgan pipeline. They could expand pipelines east. Those pipelines already exist, and they can be expanded." In fact, Enbridge, a Canadian energy company, recently asked Canadian regulators for permission to reverse the direction of one of its pipelines in Ontario, which many see as the first step to move more Canadian oil to the American East Coast — and relieve some of the Canadian oil glut in the upper Midwest. Back in Burnaby, activist West is well aware of the spider's web of pipelines exporting oil from Alberta, but that doesn't make him any less opposed to the Keystone XL. "I think it's true that the Keystone pipeline is not the only way that the oil is making its way to market, and there's definitely enough demand that if one of these gets built, people will want to build the other ones," West says. "But, you know, we really need to turn that around." But demand is the key, say most economists. If you can get American drivers to buy less gas — by raising fuel efficiency standards, as the Obama administration recently did — then, they say, you stand a much better chance of slowing production in the oil sands.